Nearing the two-year anniversary of Superstorm Sandy, developers, architects, and building owners are still wrestling with how to keep their waterfront properties safe from any future storms that may wash up on New York’s shores. Some have moved mechanical systems above ground, white others have installed heavy duty generators and emergency lighting and elevator systems. 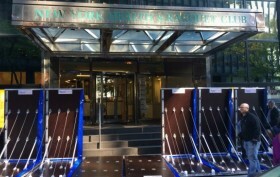 But a popular preventative mechanism among the posh residences of the West Village and Lower Manhattan is AquaFence, a portable, temporary flood barrier system that can defend structures from flood heights of up to eight feet.